For this recipe, I do not recommend canned California Olives. I prefer the flavor of brined olives – those sold in bulk, in open or lidded containers for you to scoop into a to-go container. 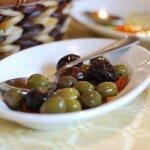 Kalamatas are my favorite but I also like Sicilian olives. These are brined in a salt/herb/spice mixture and stored in a cool place, preserving all the nutrients and health benefits of the brine. 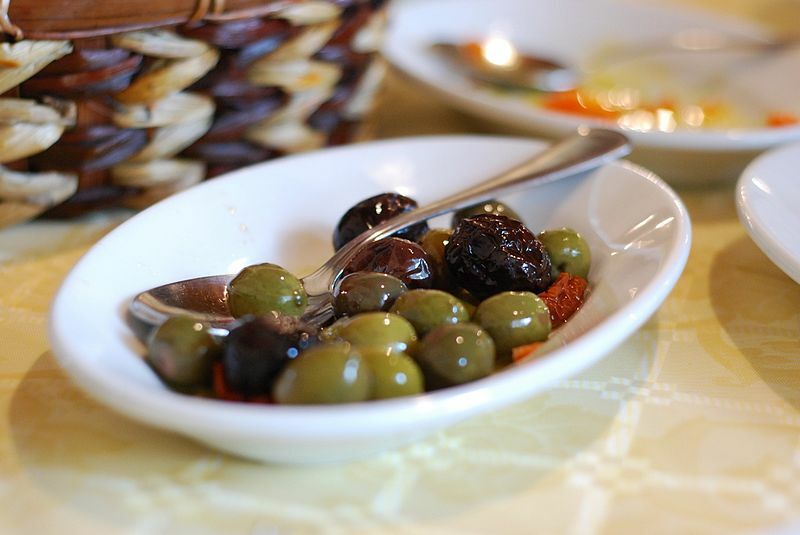 Canned olives, on the other hand, are first brined in the same way, but then the brine is poured off and replaced with vinegar before canning (heat-treated), which destroys much of the nutrient value of the olives. This recipe, adapted from Fine Cooking (1), is a variation on the Penne and Asparagus theme; see also Penne with Asparagus & Walnuts (includes variation with chicken). The original serves 4 but I’ve adapted it for 2. To save time, make up a larger batch of the bread crumbs (without the parmesan) ahead of time and store them in a glass canning jar with lid. Then add the parmesan when preparing the pasta recipe. I also provide a variation with added chicken for protein. Brine breast, then pat dry; cut into strips and lightly flour the strips. Saute in the olive oil, then push to one side of the pan to cook the asparagus and then the garlic. Then toss all together in the skillet before removing to bowl and finishing the recipe. Breadcrumbs: Heat oil over medium heat in skillet; add breadcrumbs and cook until crispy and golden, about 5 minutes, stirring occasionally. Meanwhile, chop the parsley (if using), grate the parmesan and toss together. Transfer to a bowl and toss with Parmesan mix, and salt. If not using right away, or making a large batch, transfer to a Mason jar with lid and store in the fridge. Pasta: Snap off woody ends of asparagus, then snap or cut tender part into 2” lengths. Mince garlic and set aside. Chop olives coarsely and set aside. Grate lemon zest and add to olives. Cook pasta in boiling water per instructions on package, until al dente. Drain but reserve some of the cooking water. Heat 1/2 Tbsp oil over medium-high heat in skillet. Add asparagus and toss in the hot oil to coat, and cook about 4 minutes, until crisp-tender. Lower heat to medium low and push asparagus to the side. Add remaining 1/2 Tbsp oil, then garlic, and cook until fragrant, tossing with the asparagus, about 30 seconds. Remove from heat. olives & zest into the asparagus, then season to taste. Add cooked pasta, stirring to blend; add reserved cooking water as needed just to moisten the mix, then drizzle with olive oil. Serve, garnished with the breadcrumbs. This entry was posted in Bread, Citrus, Dairy, Fat or oil, Herbs, Leafy Veggie, Olives, Pasta, Poultry and tagged asparagus, breadcrumbs, garlic, lemon zest, olives, parmesan, parsley, pasta. Bookmark the permalink.